The Intelligence Cycle is the process of developing raw information into finished intelligence for policymakers to use in decisionmaking and action. 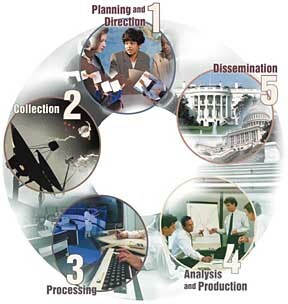 There are five steps which constitute the Intelligence Cycle. This is management of the entire effort, from identifying the need for data to delivering an intelligence product to a consumer. It is the beginning and the end of the cycle--the beginning because it involves drawing up specific collection requirements and the end because finished intelligence, which supports policy decisions, generates new requirements. The whole process depends on guidance from public officials. Policymakers--the President, his aides, the National Security Council, and other major departments and agencies of government--initiate requests for intelligence. ...is the gathering of the raw information needed to produce finished intelligence. There are many sources of information including open sources such as foreign broadcasts, newspapers, periodicals, and books. Open source reporting is integral to CIA's analytical capabilities. There are also secret sources of information. CIA's operations officers collect such information from agents abroad and from defectors who provide information obtainable in no other way. Finally, technical collection--electronics and satellite photography--plays an indispensable role in modern intelligence, such as monitoring arms control agreements and providing direct support to military forces. ...involves converting the vast amount of information collected to a form usable by analysts through decryption, language translations, and data reduction. ...is the conversion of basic information into finished intelligence. It includes integrating, evaluating, and analyzing all available data--which is often fragmentary and even contradictory--and preparing intelligence products. Analysts, who are subject-matter specialists, consider the information's reliability, validity, and relevance. They integrate data into a coherent whole, put the evaluated information in context, and produce finished intelligence that includes assessments of events and judgments about the implications of the information for the United States. The CIA devotes the bulk of its resources to providing strategic intelligence to policymakers. It performs this important function by monitoring events, warning decisionmakers about threats to the United States, and forecasting developments. The subjects involved may concern different regions, problems, or personalities in various contexts--political, geographic, economic, military, scientific, or biographic. Current events, capabilities, and future trends are examined. The CIA produces numerous written reports, which may be brief--one page or less--or lengthy studies. They may involve current intelligence, which is of immediate importance, or long-range assessments. The Agency presents some finished intelligence in oral briefings. The CIA also participates in the drafting and production of National Intelligence Estimates, which reflect the collective judgments of the Intelligence Community. The last step, which logically feeds into the first, is the distribution of the finished intelligence to the consumers, the same policymakers whose needs initiated the intelligence requirements. Finished intelligence is hand-carried daily to the President and key national security advisers. The policymakers, the recipients of finished intelligence, then make decisions based on the information, and these decisions may lead to the levying of more requirements, thus triggering the Intelligence Cycle.